Mary Berry’s Bakewell Tart recipe is solid and such a British classic, but I’ve made a few changes for those of us in the US. I’ve also discovered that using up leftover mincemeat instead of jam, makes a fabulous treat! For those of you in the UK, Mary Berry is a household name, but this is not the case in the US. American readers can skip the next paragraph and I’ll explain who Mary Berry is in the following paragraph. As you probably know, I will be at the BBC Good Food Show in Glasgow on Oct. 17th, 18th and 19th as well as Mary Berry! If you’d like to win a pair of tickets, enter the giveaway below. There will be three (3) winners who will each win 2 tickets each, and for the first time, ONLY UK RESIDENTS MAY ENTER. Good luck, I’d love to meet you there! Click HERE to buy Mary’s cookbook. Now back to my US audience: Mary Berry is an extremely accomplished baker, cookbook author, and celebrity in the UK, as she is a judge in a highly popular TV show called The Great British Bakeoff, and she just happens to have been born exactly one year, to the day, before my Dad! You needed that piece of information, right? 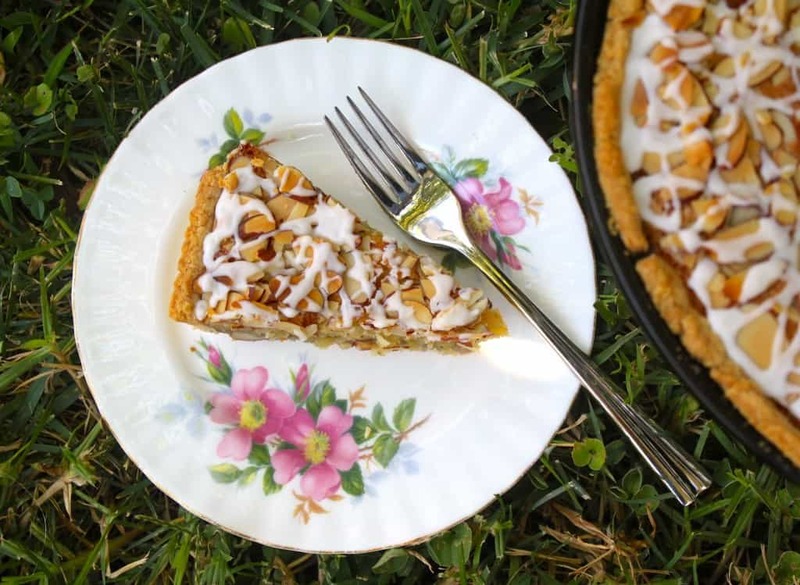 I love Mary’s English style and classic British recipes, like her Bakewell Tart. 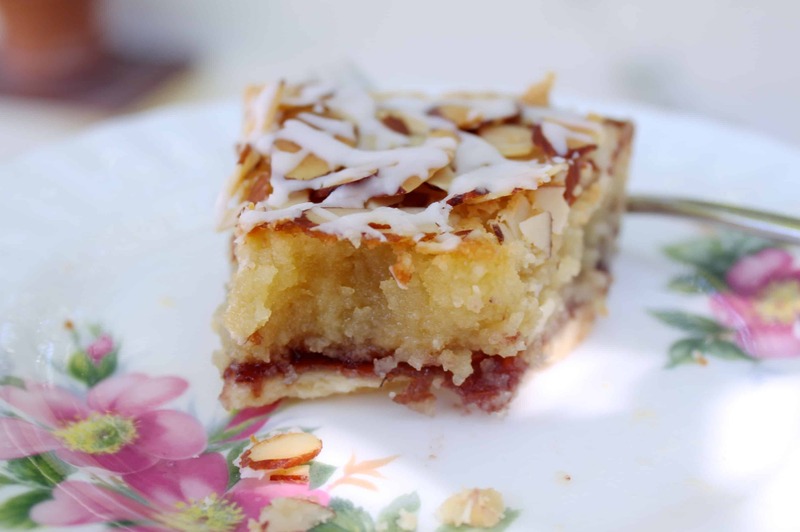 Most of you in the US have probably never even heard of a Bakewell Tart, let alone have tried one, so this is the recipe I decided to share with you. A Bakewell Tart begins with a homemade crust which is partially baked, then the bottom is covered in jam (please see below for a very delicious alternative filling to use up your Christmas mincemeat). A very simple almond flavored, custard-cake-like filling is then poured on top and it’s topped with sliced almonds and baked. Mary Berry’s Bakewell Tart recipe is fantastic. When the tart has cooled, it’s drizzled with a plain sugar icing. Need I say any more? Roll out the dough on a lightly floured surface, then line a 9″in tart tin. Refrigerate for 30 minutes. Using a fork, press the tines into the bottom and sides of the pastry in the tin, then bake for about 15 to 20 minutes, until cooked, but not completely (it’s going back in the oven.) Remove and set aside. Spread the jam or mincemeat on the bottom of the crust then make the frangipane filling. Melt the butter in a pot, remove from heat and stir in the sugar, ground almonds, egg and almond extract (if using.) 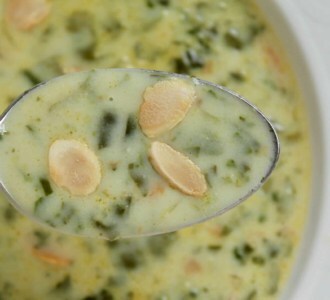 Pour the mixture over the jam or mincemeat and sprinkle the flaked almonds on top. Reduce the oven temperature to 350°F(180°C) and bake for about 30 minutes, until golden-brown and a skewer pushed into the middle comes out clean. Remove from the oven and leave to cool completely in the pan. Drizzle with icing and allow to set. Finally, cut the Bakewell Tart into slices and enjoy! If you enjoy Mary Berry’s Bakewell Tart recipe in it’s original form, then give my mincemeat version a try, too! 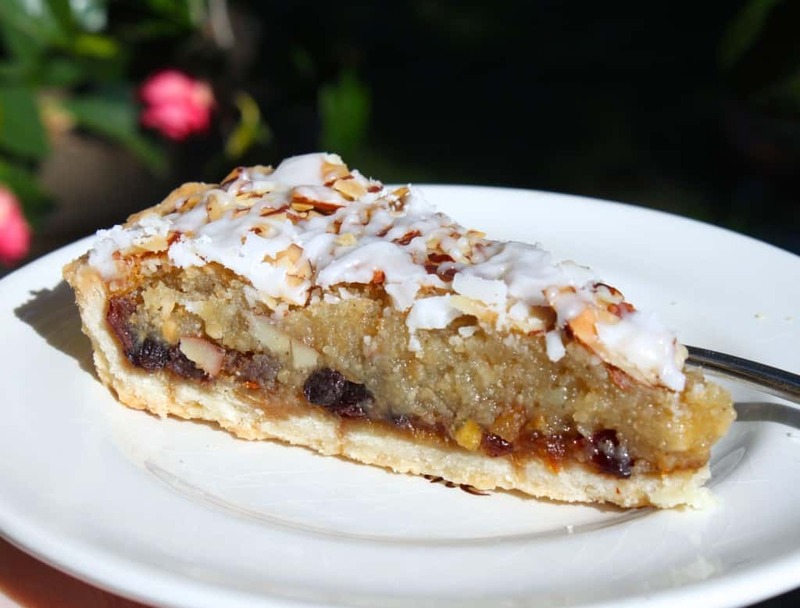 Here is a photo of the mincemeat Bakewell Tart. The homemade mincemeat combined with the other flavors works really well, and it was perfect in January to use up some leftover mincemeat from the holidays. In the meantime, I am flying to Scotland today, so I hope you’ll understand I won’t be posting much here on my blog whilst traveling, but I’ll be much more active on Facebook, Twitter, Instagram and Google+. I hope you will follow me home to Scotland–first on the agenda is the Scottish Baking Awards at Mar Hall this Sunday! I cannot wait! Don’t miss another post! 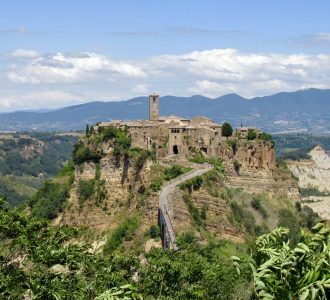 Sign up for my free subscription for recipes and travel. 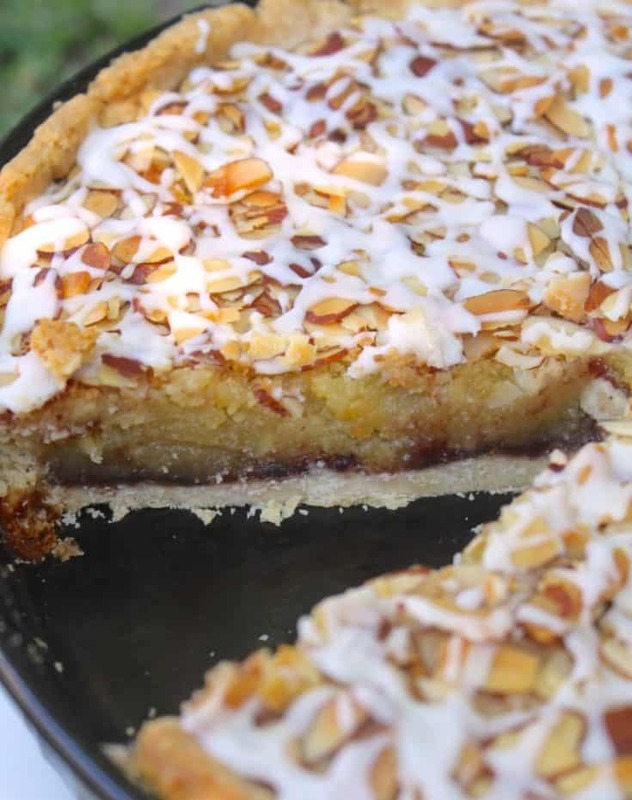 A classic British tart which has a jam base, cake like frangipane filling and almonds and icing on top. Delicious! Roll out the dough on a lightly floured surface, then line a 9"in tart tin. Refrigerate for 30 minutes. 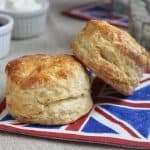 Using a fork, press the tines into the bottom and sides of the pastry in the tin, then bake for about 15 to 20 minutes, until cooked, but not completely (it's going back in the oven.) Remove and set aside. Bake for about 35 minutes. 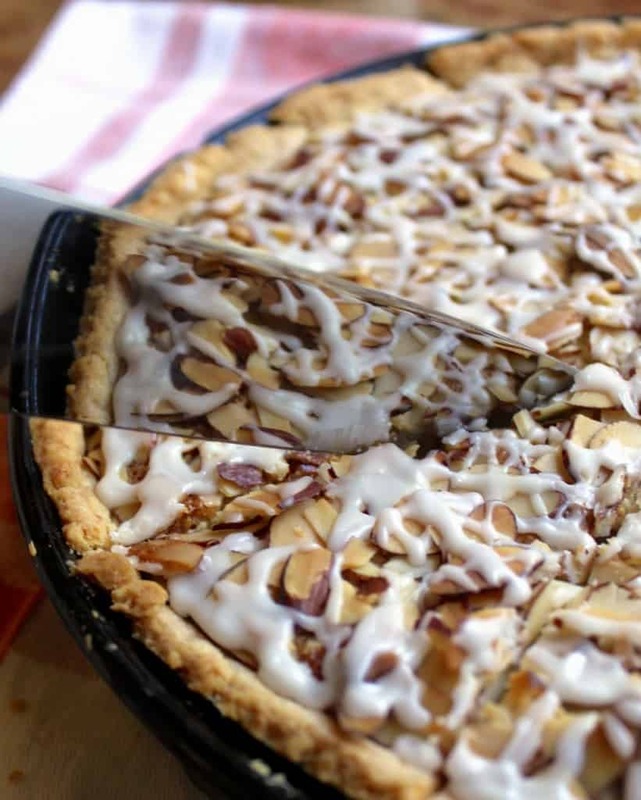 If the almonds begin to brown too quickly, cover the tart loosely with aluminum foil. Place the confectioner's sugar into a bowl. Stir in cold water or milk. 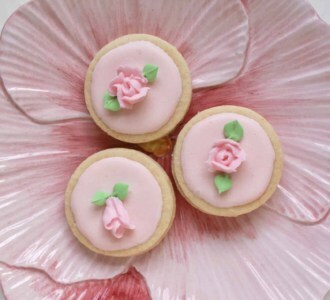 Using a knife or spoon (any kitchen cutlery would probably work), drizzle the icing all over the cooled tart (make sure it isn't warm or the icing will not look as pretty as it should.) Allow the icing to set before serving. Leave off the icing if you prefer a less sweet tart (my mum prefers it this way). I Won the World Porridge Making Championship Specialty Award for my Sticky Toffee Porridge! Do you grind your own almonds or can you buy ground almonds in US? I can only find almond flour here in Boston and I don’t think that’s the same thing. 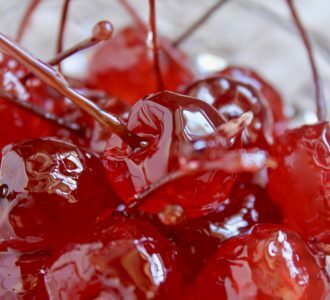 Thanks for the recipes on this site…………………..I’m from Edinburgh and have been in US for 30 years now—————————-I love looking at your recipes and remembering cakes and bakes from my childhood. No problem, Carol! I always try to reply quickly. The only problem is when I’m traveling. 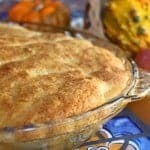 Just stumbled upon this recipe on Pinterest and I was thinking of making it for thanksgiving. Does it freeze well? Or does it hold up if I make it 2 days beforehand? Or will the crust get soggy because of the jam? Thanks in advance! Hi Becky, it’s actually a great dessert to freeze! I’ve done it several times and it’s one of those dishes that freezing does it no harm. The crust does not get soggy from the jam, and so at room temperature, it would be fine for probably 5-6 days. It’s a great choice for the holidays! Enjoy! I live in the states now but I’m a proud Scot and a baking enthusiast..
Love you’re recipes and you’re travel stories!!! Oh my! This recipe caught my eye & I knew I had to try it. Absolutely love it. We have a high school graduate breakfast this weekend. Made it with raspberry preserves & making a second one with strawberry jam. That’s fantastic, Lisa! Thank you so much for letting me (and others) know how much you liked it! Enjoy! Ok, I know I have already commented on this, but I love this recipe with the mincemeat. Soooo good. Oh wonderful, Cathy! Love that you got to try it! I’m new to baking tarts, so please forgive me if these questions are absolutely absurd – but I was reading the recipe and bought all ingredients so I could make this fine looking pastry, and low and behold looked at the actual recipe and figured out I had questions. (Yeesh). First question – can I just use a pie dish or a spring Form pan, or is a tart dish something completely different? Last question – since you increased the ingredients, do you recall how long your tart took to bake? I’m sorry for all the questions, I love baking and didn’t think this recipe was going to be any different than making a cake or pie – but I think I’m a bit out of my element. My goodness – I have always wanted to go to Scotland (as I am Irish and Scottish) so I’m going to check out all your posts! Love Ireland – and have posted a ton of photos from our trip. 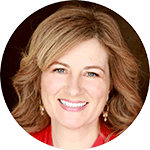 Love your blog – so happy to have found it! Thats look really great. Thanks for this wonderful post. 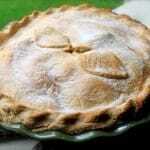 Apple pie, ultimate comfort food. This was meant to be, Christina! I need a tart to take to a friend’s home this week AND I just took a survey of the cupboard and I have 31 jars of unopened jam. This will bring me to 30! Thanks! 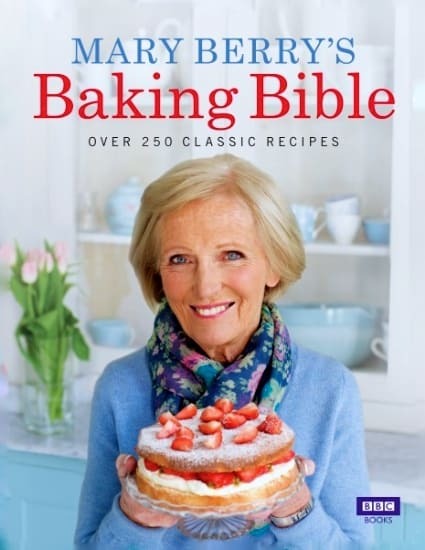 I of course do not know of Mary Berry, but I would love to see that cookbook. Have to check in the library or Amazon. This tart looks amazing and so different. I am always looking for new and exciting new recipes to try. 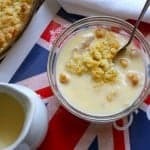 I love a lot of your Scotland foods and would be thrilled to make something from there or the UK. The almonds and icing on top must give it such a sweet flavor. I can just taste it now. Thanks for sharing this one, as usual your talent is brilliant! I hope that you had a good flight to Scotland. Please keep us informed on your travels and I am sure you will post photos. Enjoy your time…. Ooooh I like the looks of this dessert. Beautiful shots. Have the best time in Scotland. Never had chocolate tablet! Sounds good! Lovely lovely tart. I have heard of Mary Berry. Have a wonderful time in Scotland what a great honor. Okay, I can’t even tell you how badly I want this tart, but I’ll try. *ahem*…”I WANT THIS!! 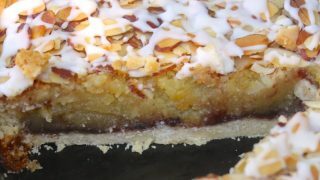 !” Looove a good Bakewell Tart and this one looks so scrumptious. Gorgeous photos, too! Have a blast in Scotland! 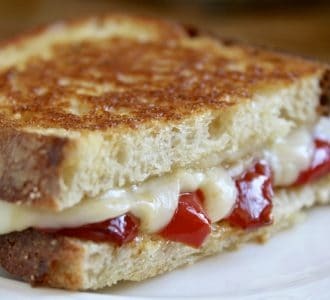 Wow, looks so yummy.. but reading about all that butter.. hm…. could put that in paleo as well I think and give it a try. I love the photos! 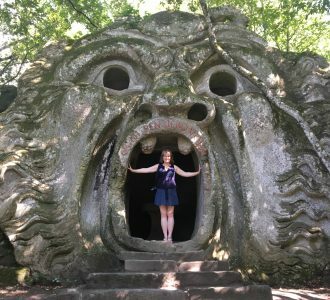 Good luck or like we say in Italy: in bocca al lupo! my favourite British baked good is a simple Scottish Shortbread! Good luck at the Good Food Show, Glasgow is always fun!